Home » What is the Best Way to Store Coffee Beans? One of the questions often asked by those new to home coffee brewing is how best to store coffee beans. It’s easy to see why there’s so much confusion out there. Search online and you’ll find all kinds of conflicting advice on the issue. 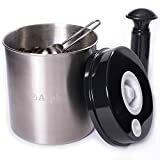 Should I store whole beans, or grind them first? For how long can I store my beans? I should store roasted coffee beans in the fridge, right? I read coffee beans can be frozen…is this right? But surely freezing coffee makes it last longer? What happens if I use ‘old’ beans? Are there any fancy gadgets that can help me here? We start with an easy one! If you buy whole roasted beans, you should grind them as you need them. It’s not a good idea to pre-grind a big batch of coffee for use in the future. When you take a whole coffee bean and grind it, you’re creating a larger surface area. As we’ll discuss in a bit more depth in a later question, the elements (water and oxygen etc.) are coffee’s main enemy when it comes to preserving quality. Greater surface area means increased exposure to these damaging elements. Pre-ground: If you buy pre-packaged, the bag should have a ‘use by’ date printed on it. This refers to the unopened pack. Once opened, you can store the coffee, ideally, for no longer than a week (or 24 hours if you’re a real connoisseur). If you buy whole beans, then the above advice applies – grind as you go to ensure maximum freshness and quality. Roasted whole beans: If you buy your beans ready roasted, there should be a date on the package. There should also be a one-way valve inside the pack to release the carbon emitted by the freshly roasted coffee (without which the back would swell and pop). Both of these things indicate freshness. Your beans are at their best around 72 hours after being roasted. After this, the quality starts to decline. You should use them within two weeks for maximum enjoyment. Again, many true coffee connoisseurs would argue that whole beans should be ground and drunk within a matter of hours – but this is more about fully appreciating the tasting notes of the coffee rather than freshness. Unroasted whole bean: Green coffee beans are sturdy fellas! From the supplier’s arrival date, they will last (properly stored) for between six months and a year. Check the arrival date with your supplier when you buy your beans if it’s not clear on the bag and only roast/grind what you need to ensure maximum flavor quality. The aim of correct storage is to prevent all of these elements from reaching the coffee beans. Therefore, the best way to store coffee is in an airtight container (removing moisture and oxygen from the equation), somewhere cool (removing heat), dry (again, removing moisture) and dark (removing light). That’s it. So, to answer the question, there’s no need to store your bean in the fridge. In fact, it can do more harm than good because the act of transferring the beans from room temperature to fridge temperature can lead to a buildup of condensation (i.e. moisture). There’s also the danger of flavor cross-contamination – ‘subtle floral notes with a hint of tuna fish and last night’s takeout pizza’ does not feature on the coffee flavor wheel for good reason! Place your coffee beans in an airtight container and store it somewhere cool, dry and dark. If you do want to go the chilled route, the freezer is preferable to the fridge. However, moisture remains an issue. Eventually, the beans will absorb this moisture and their flavor will become impaired. There’s also the issue of light exposure – with the freezer (and fridge) being frequently opened, letting damaging light flood in. If you do want to freeze your coffee beans, the best advice is to portion them out first into single serving sizes so you just take one out when you need it, thus avoiding continually raising and lowering the temperature of the whole batch. The rules about using an airtight container still apply. If you plan to keep your beans for a while, place them in the deep freeze and consider keeping them in the bag you bought them in (placing that bag inside your storage container). Make sure your beans reach room temperature before you use them. A few hours should do the trick – or overnight for brewing the following morning. A word of warning here: there is a danger that you could seriously mess up your fancy coffee machine or conical burr grinder if you don’t thaw the beans out adequately before using them. You might find manual grinding hard going, too! If you want to store green coffee beans, the best advice is to keep them away from both the fridge and the freezer. Cool and dry at room temperature, and away from direct sunlight is what the green beans like best! Again, there are conflicting views on this. If you freeze your coffee immediately after roasting, you might find you can extend its ‘shelf life’ to around eight weeks. Otherwise, the process of flavor decline will have already started. Remember that roasted coffee is at its best three days after roasting. Nothing particularly bad – unless there is visible mold or bugs living in them, of course! When we talk about old coffee, what we really mean is coffee that’s gone stale. This will impact the flavor experience, but not your health. 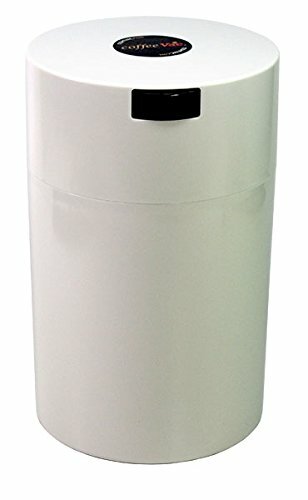 Coffeevac Vacuum Sealed Coffee Containers: These containers create a partial vacuum seal that allows the coffee beans to breathe and degas, without letting in damaging oxygen. They come in a range of colors and sizes. 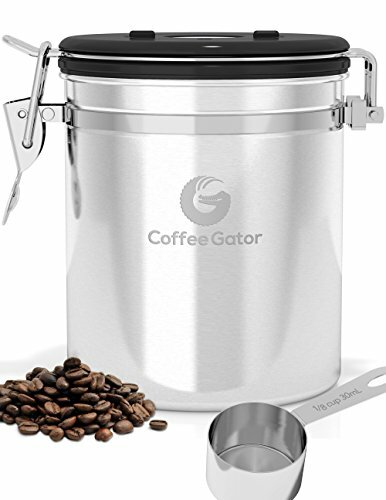 Coffee Gator Coffee Canister: This is another handy storage device that promises to protect coffee beans from the elements. It includes a scoop for easy portioning and a date wheel so you can keep track of storage time. 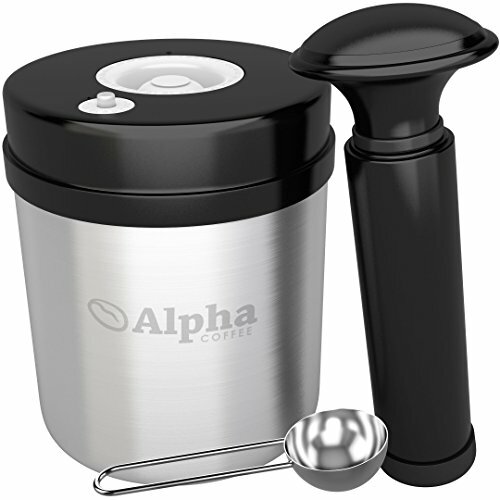 Alpha Coffee Container with Vacuum Seal: If you want something a bit more high-tech, this storage device comes with a pump that allows you to create a powerful vacuum. The advantage of these types of containers is that you can remove the oxygen from the coffee’s environment. However, while there are plenty of storage devices on the market, it’s important to understand that you don’t need to splash out on fancy gadgets. As long as you place the beans in an airtight/airlocked container, store it in a cool, dry environment, and use your beans within the recommended storage time, you should be fine. A ceramic or opaque container with a sealable lid (or a mason jar) will work just as well as anything else on the market. Remember that the overall goal in coffee bean storage is to protect them from the damaging elements and preserve the inherent flavor. Pretty much! Hopefully, we’ve been able to set you straight on how best to store your best coffee beans. We’ll leave with the best overall advice, which is to just buy the quantity of beans you’re likely to need for a week or two at a time. This way, you can minimize storage time and ensure you enjoy your beans at their freshest – just as the roaster intended.